Wouldn’t it be great to have these coding standards checked automatically? Magento 2 comes with two tools which can check code quality based on certain rules. Basic rules are also included in Magento 2. Both check for slightly different parts of the PHP code: PHP CodeSniffer checks for formatting errors mostly, while PHP Mess Detector uses metrics to check for “soft” code quality. In the example, we have issues violating the PHPCS rules (with hints on how to fix them with another tool called “PHP Code Beautifier” (phpcbf)) and, below, issues violating the PHPMD rules. 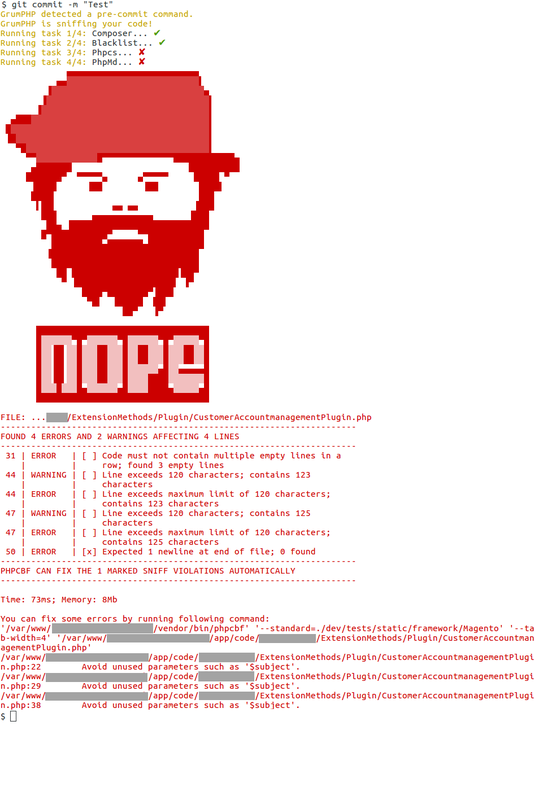 Two other checks named “Composer” and “Blacklist” are performed. If an issue is found, the code is not committed, so you have to fix the issue and commit again. If you are familiar with Magento 2 backend development, you might have noticed the error message Avoid unused parameters such as '$subject'. for a plugin. You cannot avoid to have the $subject variable in your method signature for plugins though, and if you don’t need to call it, it’s perfectly reasonable. So what to do with errors which are reported wrongly? 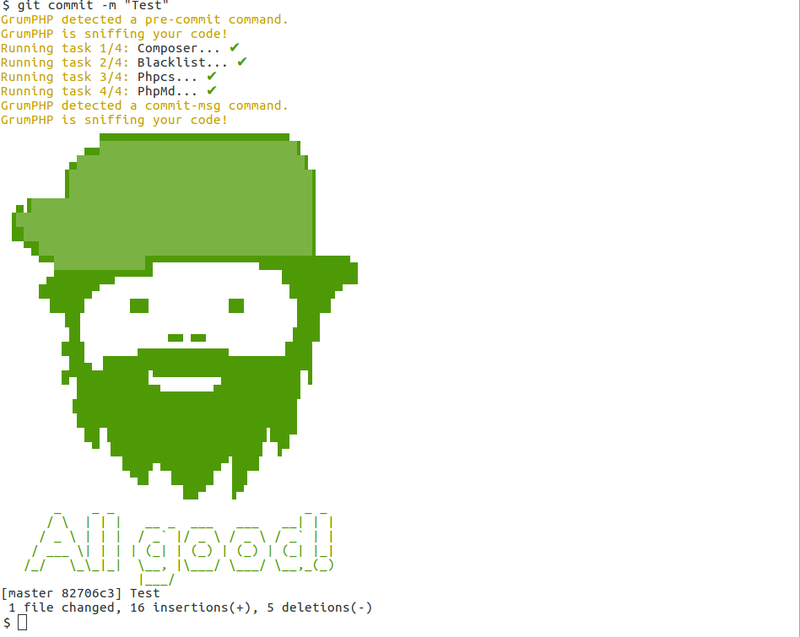 You can find a list of all PHPMD rules and their identifiers at phpmd.org/rules/index.html. For the PHP Code Sniffer, there is a similar mechanism although there are usually fewer reasons to ignore them. You can find more information at github.com/squizlabs/PHP_CodeSniffer/wiki/Advanced-Usage. 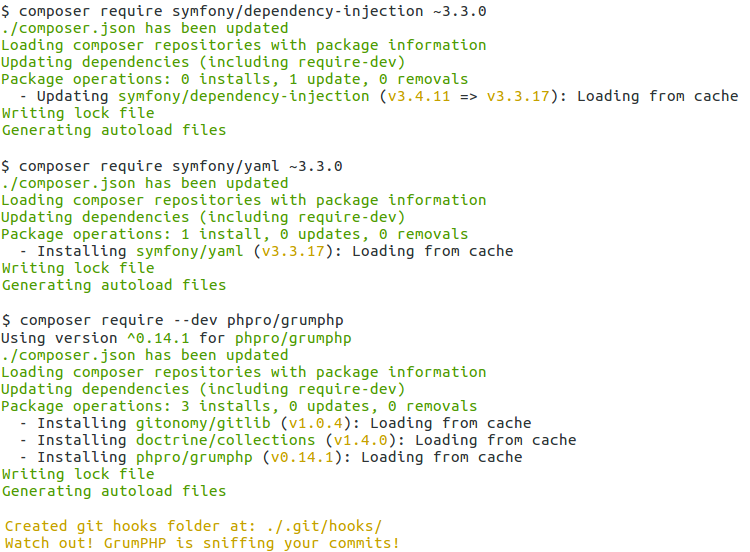 The first two commands are for downgrading existing packages so they are compatible with both Magento 2 and GrumPHP. As you can see, the git hook is created automatically on installation. You might have to adjust the magento_dir variable and the path of the composer.json. Otherwise, it’s ready to go. Feel free to add more keywords to the blacklist, add more tasks or adjust the rules. See the GrumPHP documentation on how to create, configure and activate custom and existing tasks. i also added following lines to git_blacklist keywords to avoid adding merge conflicts.